"Something’s afoot. The steward smiles at you like he has a secret, or like he thinks you have a secret, or like you think he thinks you have a secret. There are secret plots brewing, you’re sure of it. At the very least, there are yours. A passing servant murmurs, “The eggs are on the plate.” You frantically search your codebook for the translation before realizing he means that breakfast is ready. Excellent. Everything is going according to plan." 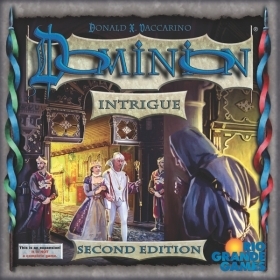 Dominion: Intrigue (Second Edition), an expansion for Dominion or Dominion (Second Edition), contains 26 Kingdom card types that can be used with the base game, while also adding rules for playing with up to eight players at two tables or for playing a single game with up to six players. 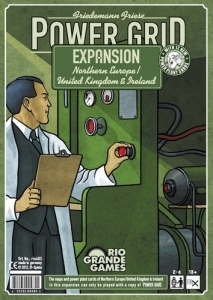 Dominion: Intrigue (Second Edition) replaces six Kingdom card types from the first edition with six new types of Kingdom cards, while also replacing the blank cards in that item with a seventh new Kingdom card. These new cards are available on their own in the Dominion: Intrigue Update Pack. 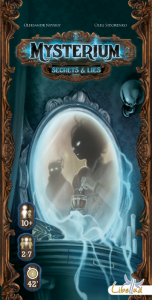 The rulebook has been rewritten, one card has a mild functional change (Masquerade skips players with no cards in hand), and other cards have been rephrased (while remaining functionally the same).